Bremerton is ready for a HAWK signal, city leaders believe. And what does that mean? The High-intensity activated crosswalk beacon is a fancy way of saying pedestrians are getting their own traffic light to cross Sixth Street at High Avenue (concept pictured). Currently, you have to walk to either Veneta Avenue or Naval Avenue to find a safe place to cross there. The pedestrian improvement is one of five around the city, totaling $688,000 in grant-funded projects. The Bremerton City Council approved a contractor to begin the work in July, with completion in September. 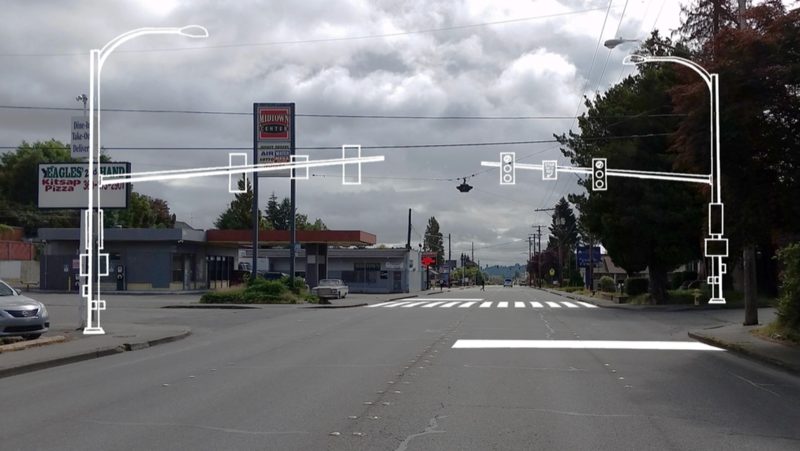 Another intersection, Kitsap Way and Harlow Drive, is due to get a crosswalk, “flashing beacon” to help with crossing and a pedestrian island in the middle of the road to make easier as well. There have been recent calls from Kitsap Lake Junction to get something to help with crossing the runway-sized street. More pedestrian improvements are coming to Kitsap Way and 11th Street, Charleston Boulevard and First Street and 11th Street and High Avenue. Councilman Greg Wheeler, himself a frequent walker around town, praised the changes, which he says have “opened up opportunities” for pedestrians of all kinds to get around town. “We’ve literally had a hard time getting folks safely across our city,” he said. The most contentious issue on Wednesday’s agenda was two contracts with Kitsap County, respectively, to do road striping and paving. That may sound like routine work, but city and county lawyers have for months been disagreeing over the language of the agreements to do the work. “The holdup has been indemnification language,” Bremerton Public Works Director Chal Martin told the Council. Basically, the county, in doing the work, does not want to be held liable for anything that happens along the way, unless they are the “sole” cause of it. Martin ultimately asked the Council to approve the contracts, even with the language. The reason: the re-striping of the city’s streets will cost about $60,000 if the county completes it. A private contract would run about $120,000 to $200,000, Martin told the Council. That risk-reward equation divided the Council. Wheeler and Councilwomen Leslie Daugs and Pat Sullivan voted against it. The other four voted for it, so it barely passed, 4-3. “Our city is a better place for her having lived here,” Lent said. In his monthly report, Bremerton Police Chief Steve Strachan talked about how the department is ramping up its bicycle patrols. Strachan said that in April and May, cops on bikes hit the streets of downtown and in surrounding neighborhoods. Officers made 50 arrests in two months, to go with 361 “contacts,” or face-to-face interactions. “We’re hitting it very very hard,” Strachan said. Councilman Jerry McDonald, who represents downtown and Manette, was appreciative of the efforts and hoped the department could do more. “I know they’re making a difference out there,” he said. 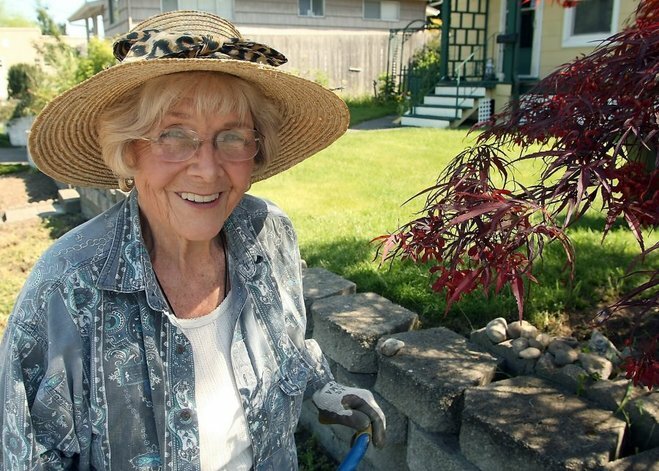 A $7,500 grant from the Washington State Department of Natural Resources will fund the planting of 50 trees at Blueberry Park in East Bremerton, which the Council approved. The City Council approved $544,000 for a contract with Regency BlueShield to pay for medical expenses not covered by Medicare for what are known as the city’s LEOFF 1 retirees. These retirees from the city’s police and fire departments have medical expenses paid for in retirement. That changed in 1977 and now police and firefighters are covered under the LEOFF 2 plan, which does not fund health care in retirement. The Associated Press did a three-part series on the LEOFF system, which you can read here. The Council did not discuss the “most comprehensive” parking study in city history, as some have called it, but simply approved it through the consent agenda. To read more about the $110,000 study, click here. If you’re interested in learning more, check out the full Council packet here. Still missing from any sidewalk curb action at the intersection of National Ave at the West Hills Stem Academy. ADA compliant curbing at that school crossing would be beneficial to the community and school children. There’s been some talk to this affect, Jim. Part of the issue is some of National is in the county and some is in the city. Thank you for commenting.